WE MADE THE HALL OF FAME WOW THANKS EVERYONE - Escape Room Tampa, Florida | Can You Escape? TAMPA July 9, 2018 -- Can You Escape? 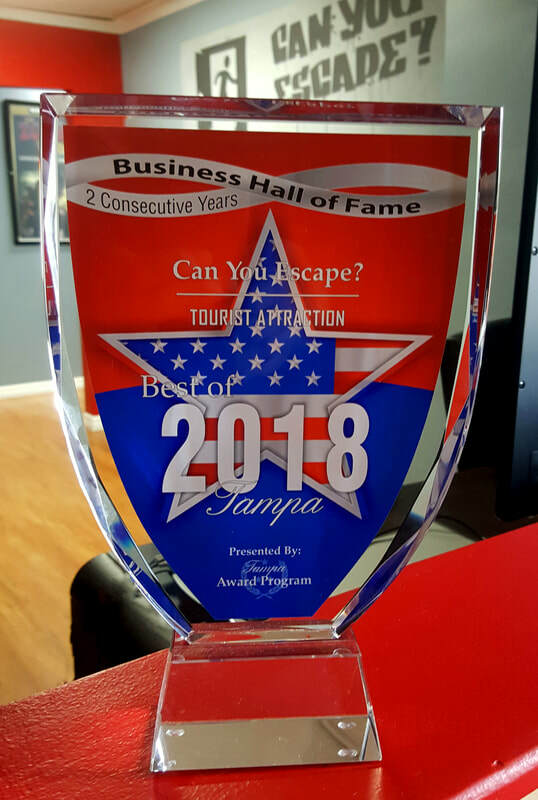 has been selected as the Best Tourist Attraction in Tampa for 2018 by the Best of Tampa Awards Program. This is the second year in a row the escape room company has received the honor, earning it Hall of Fame status. Various sources of information were gathered and analyzed to choose the winners in each category. The 2018 Tampa Award Program focuses on quality, not quantity. Winners are determined based on the information gathered both internally by the Tampa Award Program and data provided by third parties. Can You Escape? is Tampa’s #1 escape game provider. The two-year-old company boasts one of the largest escape room venues in the world, hosting up to 75 people per hour and currently operating 8 rooms with another opening in July. The venue offers team building groups, families, friends and teams of all sizes the opportunity to Escape from the Office, Escape from London, take the King’s Challenge with The Medieval Adventure, and be Trapped in a Room with a Zombie. The concept of escape rooms, also called puzzle rooms or real-live escape games, is the fastest growing trend in attractions worldwide. Teams are locked inside fully themed rooms and have one hour to find the clues, solve the puzzles and figure out a way to open the door. Their popularity exploded so suddenly that TripAdvisor has had to change their algorithms several times because the games were ranking higher than international landmarks such as the Eiffel Tower, the British Museum, and the Statue of Liberty. The Tampa Award Program is an annual awards program honoring the achievements and accomplishments of local businesses throughout the Tampa area. Recognition is given to those companies that have shown the ability to use their best practices and implemented programs to generate competitive advantages and long-term value. The Tampa Award Program was established to recognize the best of local businesses in our community. Our organization works exclusively with local business owners, trade groups, professional associations and other business advertising and marketing groups. Our mission is to recognize the small business community's contributions to the U.S. economy.